The presence of nature in group activities--through natural settings, altars, decorations, and more--provides grounding, beauty and inspiration. Nature gives perspective, letting us know we are one small part of a very large whole, always connected. 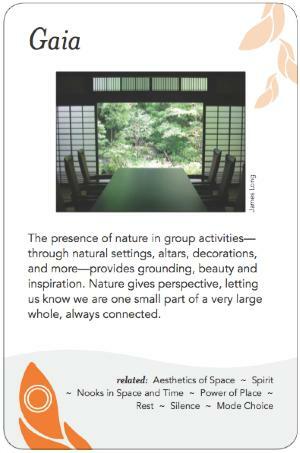 The facilitator can bring nature inside (talking stick/rock, open windows and doors, have natural objects or animals present), or take the group outside into nature (using decks & patios, transitional outdoor spaces), or simply direct the group's attention outward, calling on the wisdom of trees or land, opening the group to the larger context. Retreats in nature can be the most inspiring and creative locations for group process work. When the group's issues are causing stress, or when our personal needs and egos are demanding attention, the close presence of nature can help the group to shift perspective. Invoking and studying nature can teach the group about complex systems and natural dynamics, e.g. how a river flows, how willows bend with the wind, how moisture or dryness affects an object, how wild creatures address analogous situations (biomimicry is the basis of much modern scientific and technological invention). The facilitator can remind the group, especially if it gets discouraged or discordant, that the work they are doing is to some extent on behalf of all life on Earth, not just the group in the room. The facilitator can also invoke nature effectively in group visualization exercises using natural images to stimulate creativity and shift the energy, and by using natural metaphors, such as seasons or plants, e.g. dandelions pushing through concrete, geese flocking, ants in a hive, as means of explanation and exploration. By reminding the group that we too are animals, and that a lot of what happens in group dynamics is the same as with other animals - play, status/dominance, and so on - the group may be prompted to draw on their knowledge of the natural world to address the issues at hand. The facilitator can help the group in getting grounded in place: appreciating where they are, the history of the place (natural & human), where their food and water come from, etc. Invoking nature in a group setting can provoke very diverse reactions based on differing cultural norms and traditions. Future Search insistence on natural light in all group activities. Leadership in a Self-Organizing World event had an altar in the middle, which became a point of focus, people played with it and referred to it a lot. Natural consensus method includes a check-in with the outdoors. Spirited Work group met seasonally, the influences of the changing seasons had an important impact on their work.